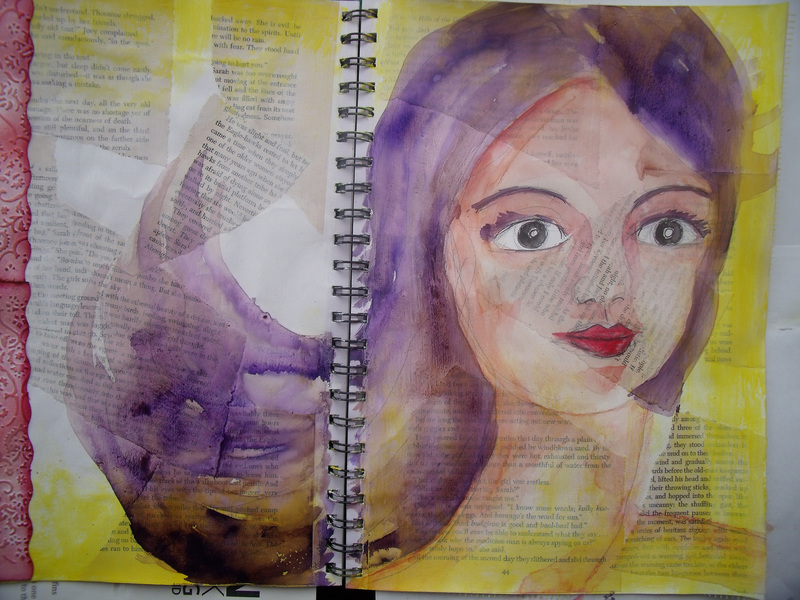 I’ve managed to completely discombobulate myself with all my new found arty-farty techniques, new equipment and re-found mediums – shall I use the water paints or the fluid acrylics or the water soluble pastels or the water soluble crayons? Perhaps I should just use the inks and sprays I am used to – but then why are all these pretty colours sitting on my desk smiling at me hopefully? 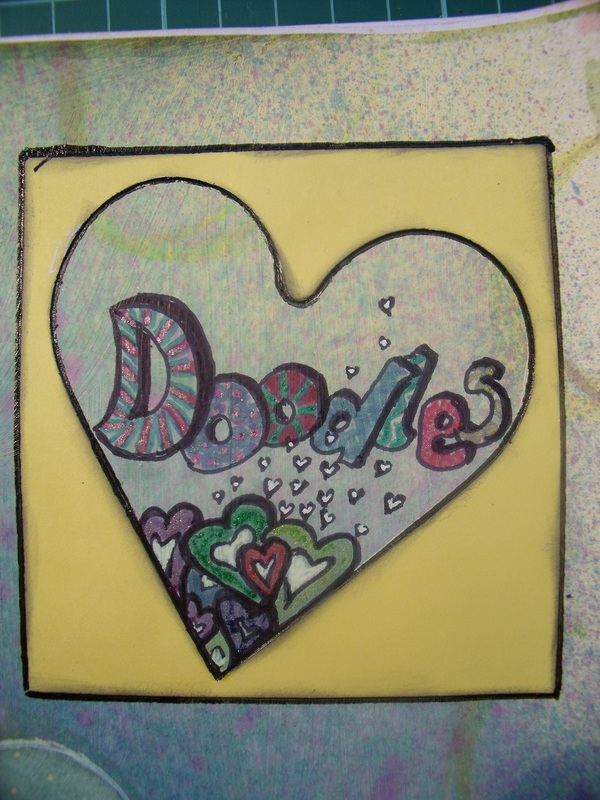 Shall I doodle, draw freehand or use stencils? Shall I layer or not layer? How will I ever become an artiste if I can’t decide which medium to use? Is it kosher to use ’em all at once? To add to my confusion I took a short on-line class with the remarkably talented Valerie Sjodin. Her work is stunning and she works with accuracy and attention to detail. Doesn’t really sound like me does it? 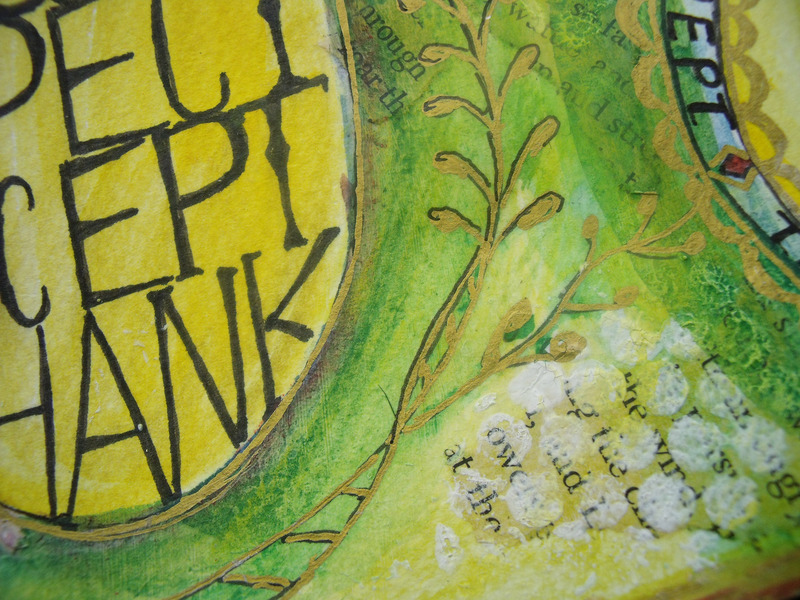 One aspect which was really new for me was doing the lettering first – usually I do any writing towards the end of my process and, with a blank sheet of white paper looking back at me, I found it impossible to picture how it would look at the end – which is pretty obvious when you see the end! It is so interesting learning different ways of working and so challenging too! I learnt a lot but didn’t have a hope of coming anywhere near the beauty of Valerie’s work. Standing back to assess my effort, I told Orlando despondently it wasn’t working out for me because I didn’t have the right paint colours and he just stretched up and asked for a dance. We had a wee dance around the studio – well, to be accurate, I do the dancing – swaying really – and he sits up in my arms, head back, eyes closed and purrs and harrumps and warbles with bliss….. But this first effort is pretty dismal! Usually when I make a muck up I can retrieve, cover, change, somehow redeem something – but there is nothing on this page I like. 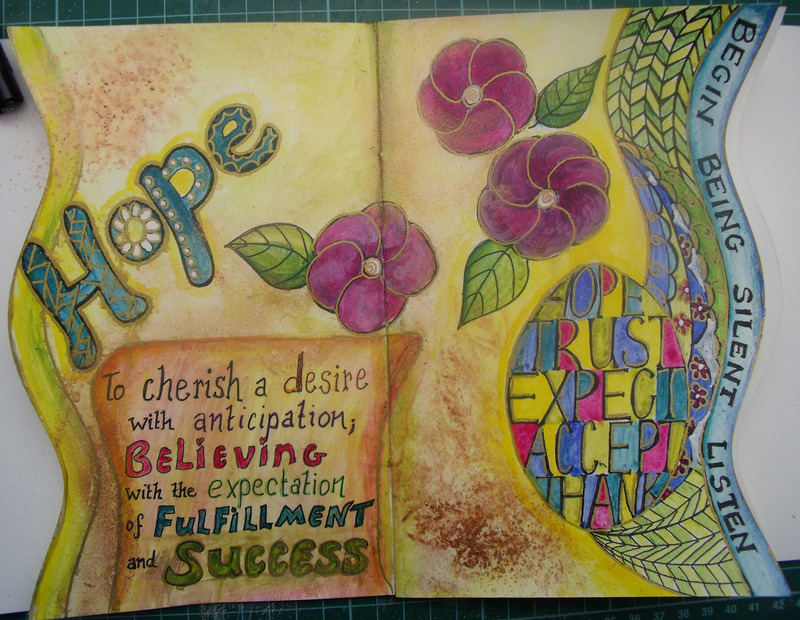 The background is flat and uninspiring and I over-doodled on the right hand edge. The splodges of gold are an aborted attempt to stencil some leaves with gold perfect pearls – which is a brilliant thing to do provided you don’t blast them over enthusiastically with the very large water spritzer bottle picked up mistakenly because you weren’t really concentrating at that particular moment, and thusly cause them to just go glump! Let’s see, what else ….. I don’t like the colours I’ve put on the egg shaped words. There should have been a gap between that egg of words and the doodled edge – and the rest of the wording is – well, just rubbish really! 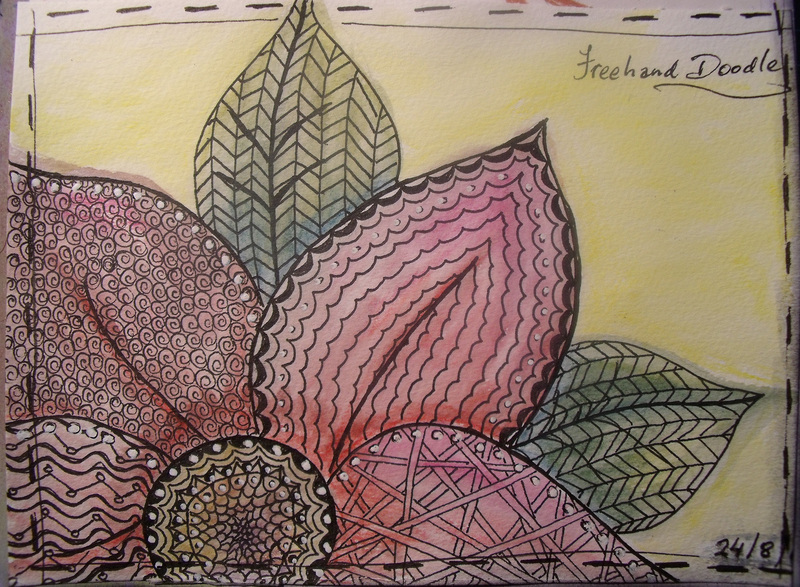 I doodled the flowers and edges and felt much happier. All in all, much happier with version two – do you agree? Thank you for coming by today, love that you did! It’s September, my birthday is later this week and Spring is here! How much better can it get? 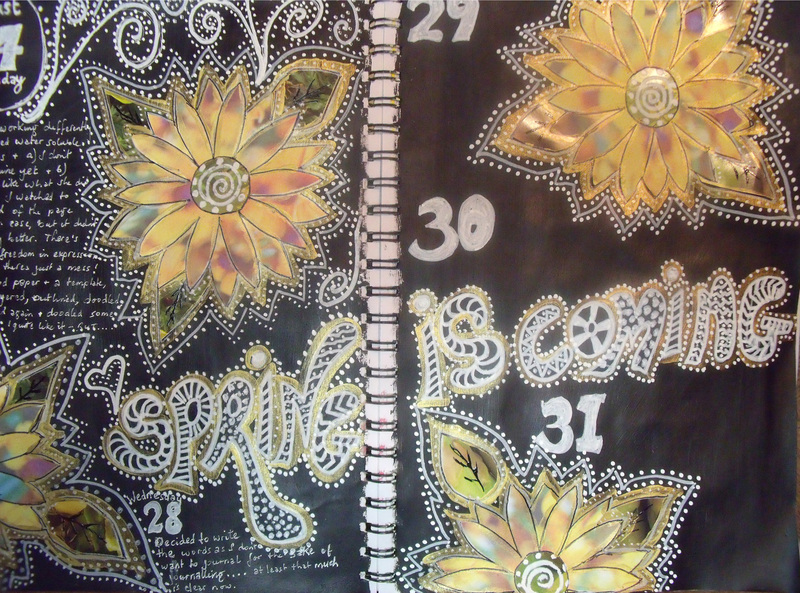 I always think of Spring as a new beginning, and I am also at a ‘new beginning’ stage in my life and I wanted to make a journal page to commemorate both these events. I had gone on line a couple of days back and treated myself to a pile of new art products: half a dozen Golden Fluid Acrylics; Pitt pens in all sizes, water colour paints, water soluble oil pastels and a selection of pastel gliders. While there I also purchased a selection of sketching pencils and graphite pencils and charcoal in pencil form and slabs. And a calligraphy pen. It all arrived on my doorstep yesterday and I was ready to rock and roll! 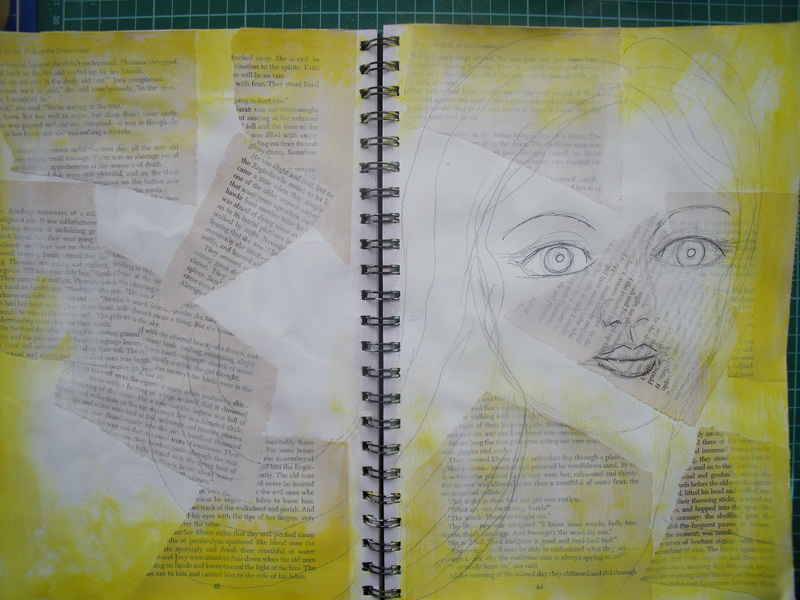 I lay down some old book pages, put a good wash of gesso over the pages and edged with that gorgeous Hansa Yellow – one of my new paints. I sketched the face and went to watch the next installment. In adjusting it I mucked everything up – not only because of the nose placement, but also because I have all these new toys and tried to put ’em all onto the same page at once ….. sigh! I never learn! Any way, I was so engrossed in my artistic conundrum that I never gave the camera a thought until today – and as you can see, flowers hide a multitude of sins and I’m delighted with the end result! And those purple flowers were fussy cut from a sheet of designer paper and they are flocked, so quite pleasing to the touch. A quick aside: I’d had that sheet of paper in my stash for some years – it was one of those things that was just to beautiful to actually use – I thought it would probably stay there forever. So another thing I take away from this course is the ability to actually dive in and use the stuff I squirrel away … hah! Ten points to Julie!! Thanks for sticking with me on this process – I have one more spread to do before things go back to normal – what ever that is – I hope you will come back for it. I started well, laying down a coat of white gesso followed by two coats of black paint as I did not have to hand any black gesso. Then the rebellion started. I didn’t like what I was seeing [multi-coloured scribbles of water soluble crayon to make three flowers] so I made my own flowers from design paper and a template. I made every flower two layers, off-setting the layers. I cut one completed flower in half. 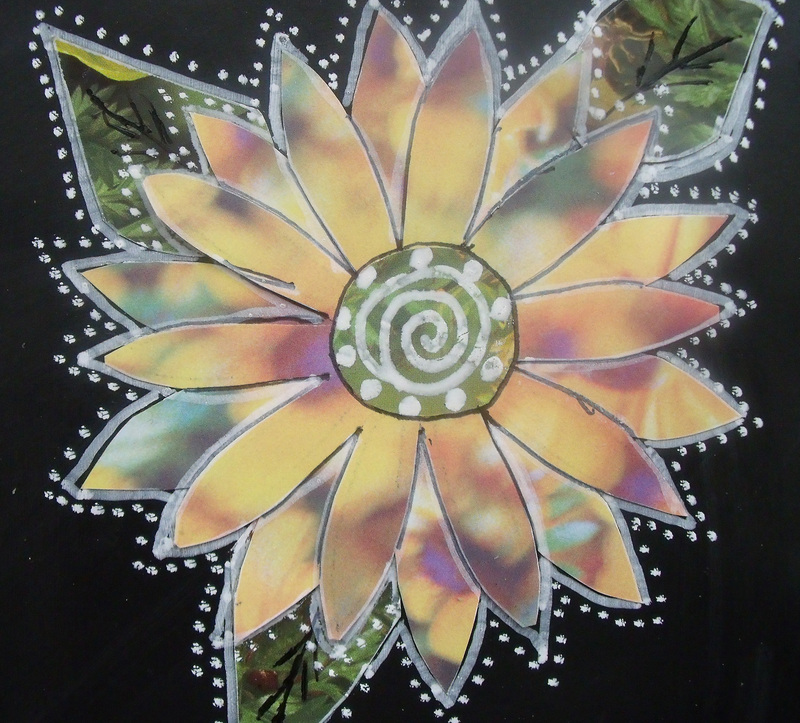 I outlined the petals with a black pen and then doodled dots and lines as the tutor indicated. 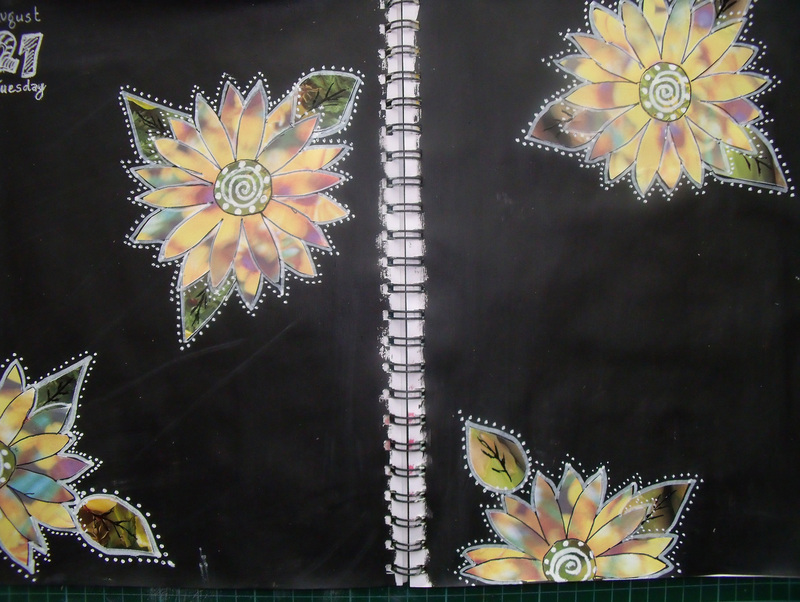 Next day I began by edging everything with a gold pen ………..
Apart from the flowers and gold paint, this double page spread was made almost exclusively with a paint pen – which is really just a fat ‘Sharpie’ like marker filled with white acrylic paint. 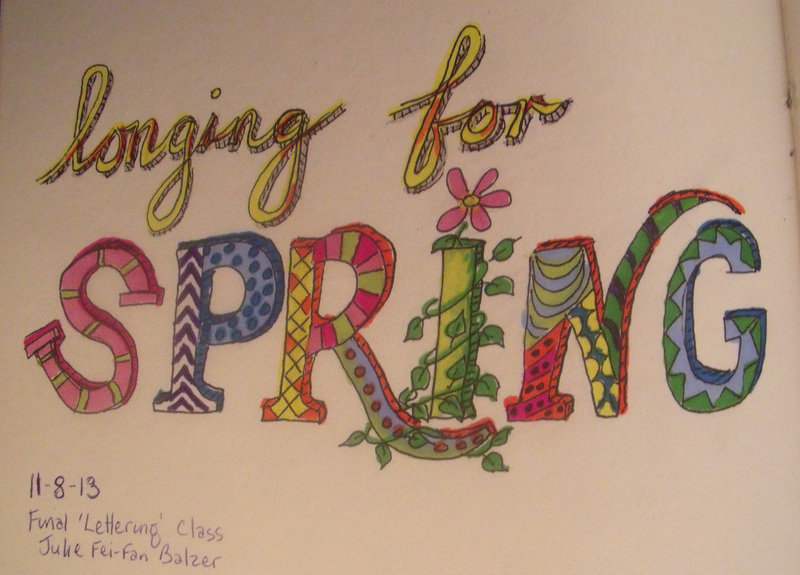 Over these four days I dotted, doodled, scripted ‘Spring is coming’ [because it really is – Hallelujah!!] and recorded my thoughts on the process. 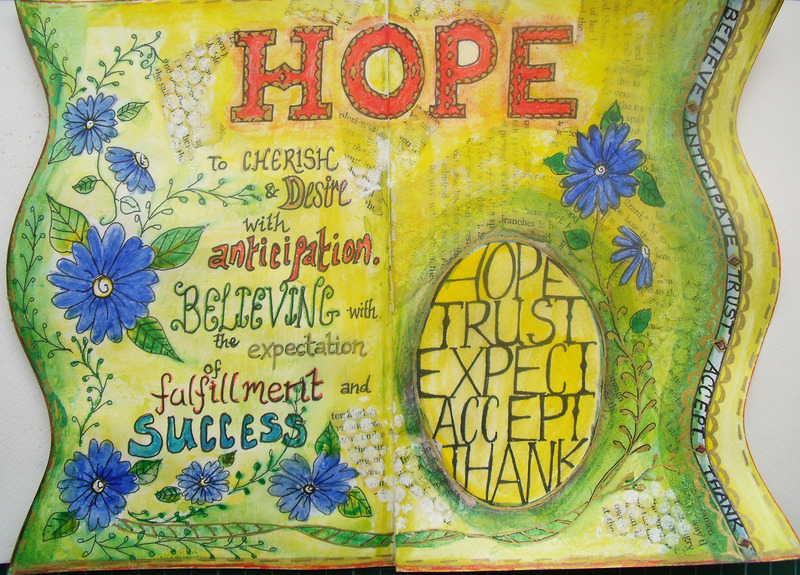 My thoughts on the process have settled into – I don’t really like this style of working in my art journal. Which is good to gain clarity on. 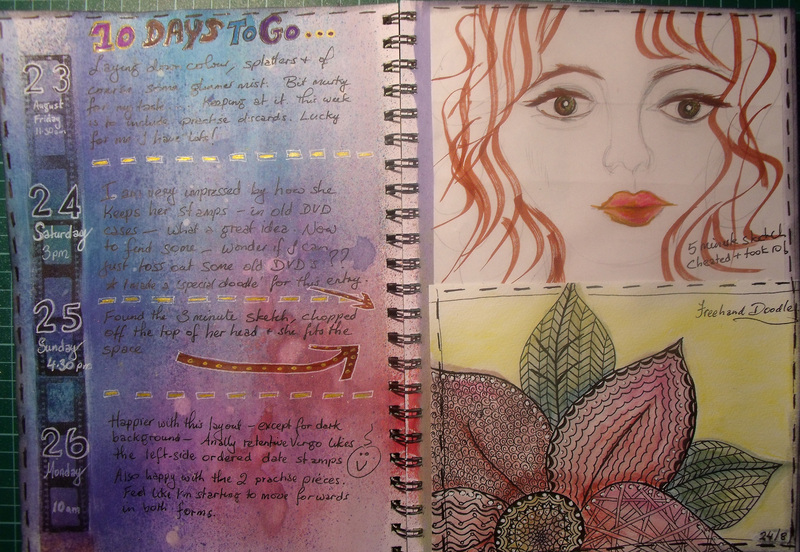 I don’t use my art journal as a diary. I use it to try out ‘good ideas’ or to play about and see what happens and am not that comfortable with mixing up the two. I also tend to work organically developing and tweaking the original idea for quite a while before moving on to something different. Having said that I feel I have been freed up a lot while engaged in the process, I’ve tried loads of different things, been introduced to radically different concepts [for me] and I’m pretty sure they will spill over in some way into my continuing work. I’m also not a ten-minuter. I’m a sixty minuter or more! 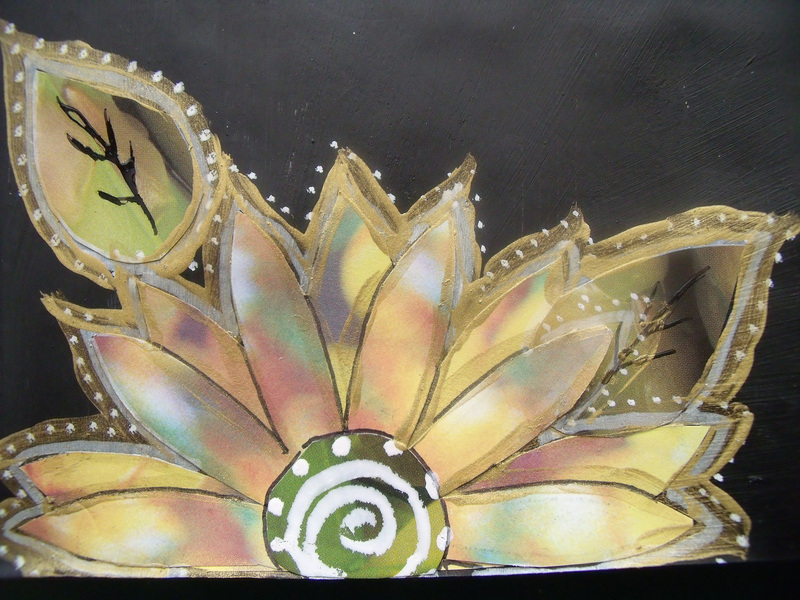 I have the time and I like to spend it carefully crafting and trying, discarding, re-doing and endlessly tweaking. These are all really great discoveries to make and I am so grateful to have been able to take this workshop and find it all out. I no longer need castigate myself for my slow and ponderous efforts. I’m a plodder and proud of it! I might have to rename my blog ‘The Happy Plodder’ – has a certain ring don’t you think? 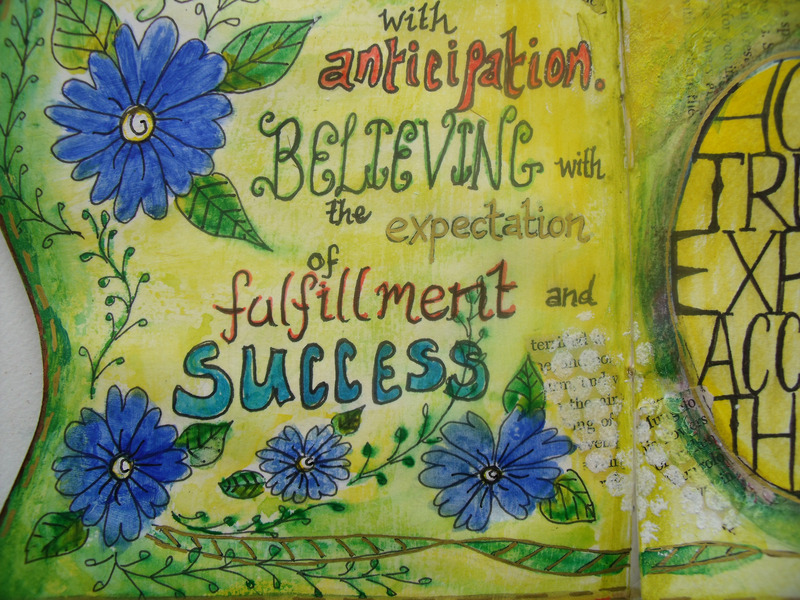 The keen eyed among my bloggie friends will spot that I am projecting myself a day into the future … [I’m publishing this Friday 30th – a deliciously spring-like evening in my part of New Zealand] I cheated, I just can’t look at the dots and doodles and swirls and spots any longer! Please do pop back and see what happens next. I know I’m curious to know…. Thanks for coming by – have a great weekend! 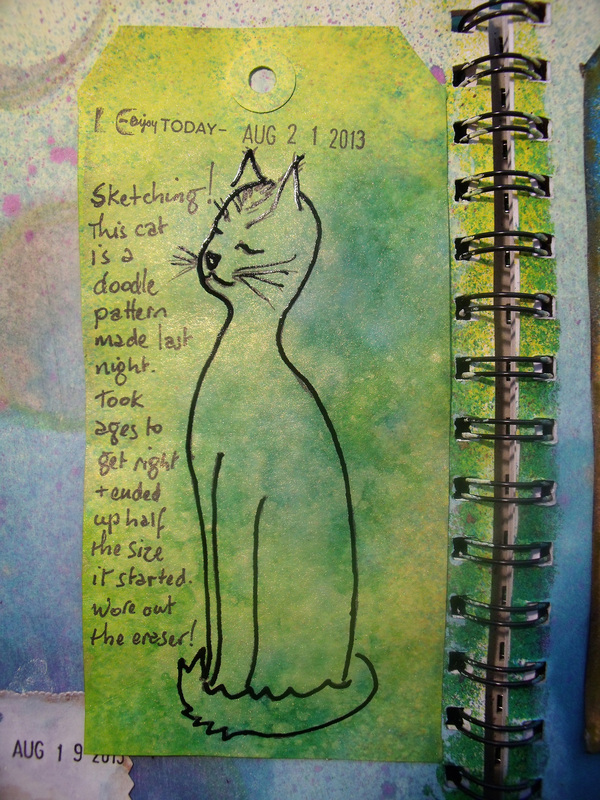 Here I am again, continuing with posts of my adventures in learning how to journal in just 10 minutes a day. 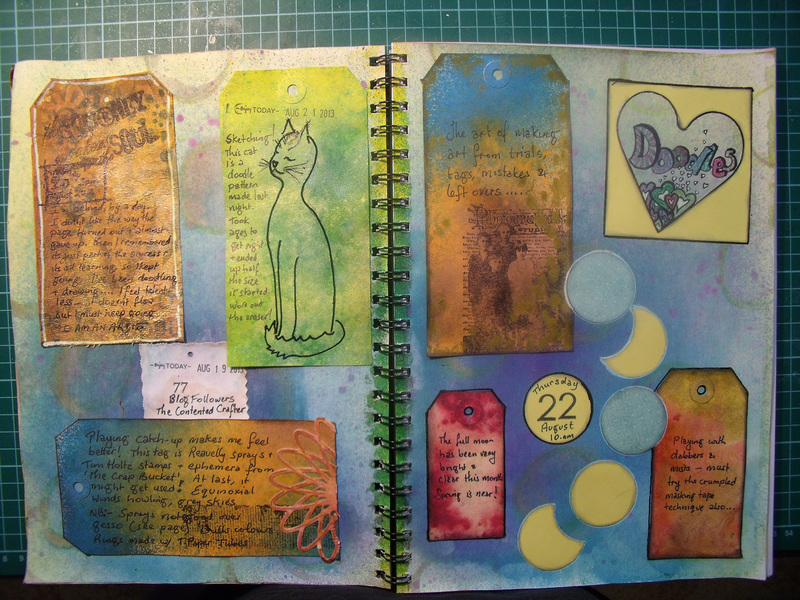 This is the third spread and marks twelve days completed of the thirty. But off I went obediently – the penny is beginning to drop. I might be challenged by these new processes, but in the end something quite interesting does appear, and if nothing else, I learn new ways of looking at old things. I have to admit I do not like the dark hue of the painted page. 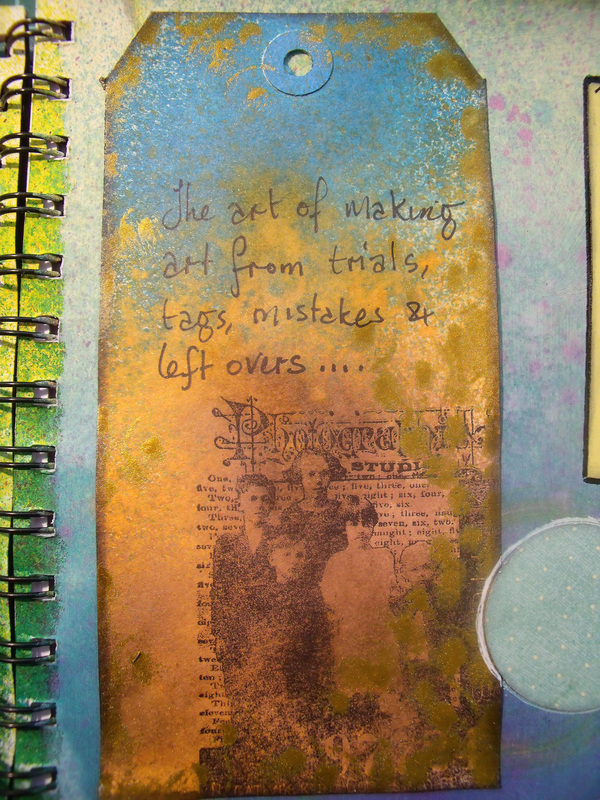 I didn’t gesso this page so am guessing it is the quality of the paper in this journal that is leeching the brightness from my sprays, inks and paints. 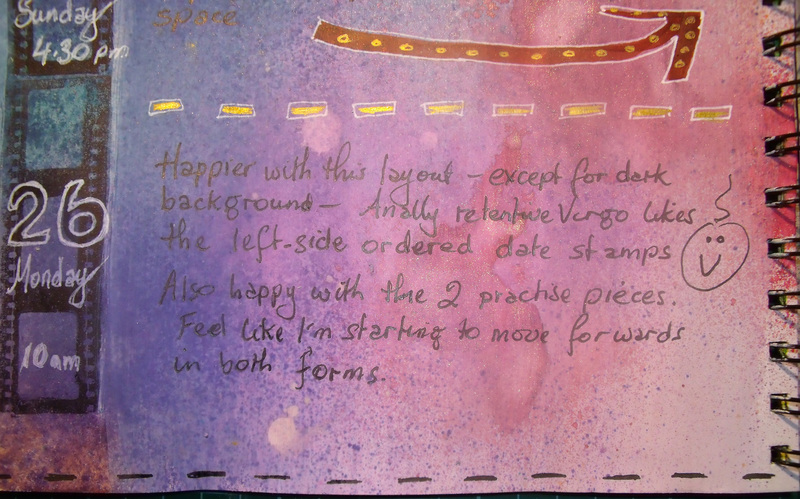 This layout includes some practise pieces. 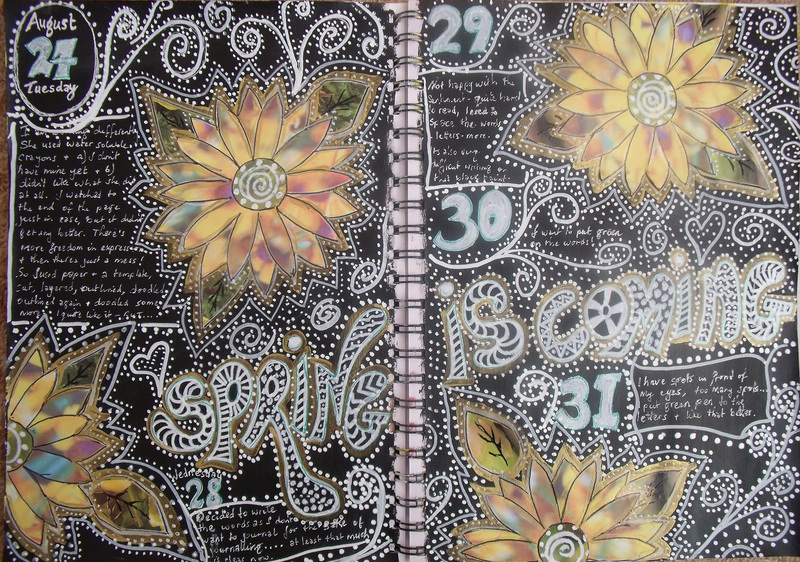 I was already doodling away at the flower, practising my free-form doodles and decided to include it in this page. It is drawn in black pen and coloured with water colour pencils. 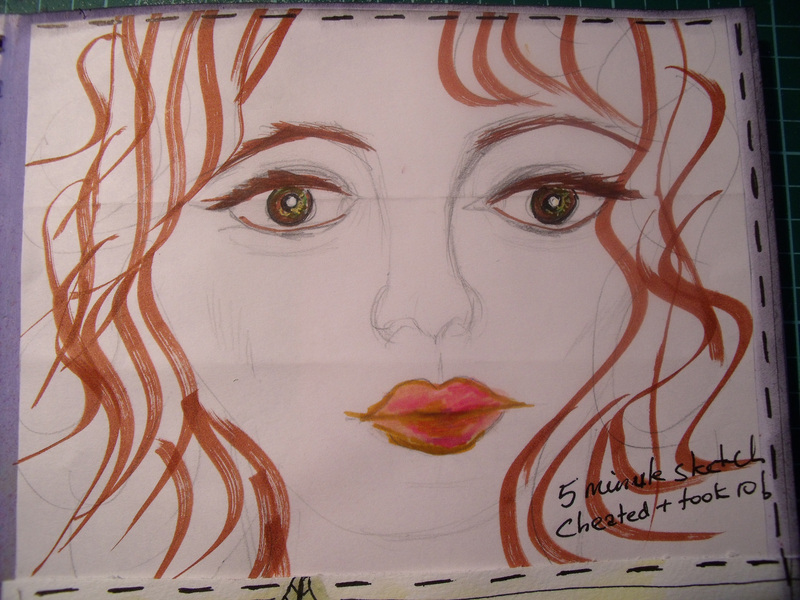 The following day I rifled through the pile of scrap paper and found the face. it was one of those 5 minute exercises where I was trying to get the eyes to come alive and I ended up taking 10 minutes on it. So she got bunged in for the Sunday entry. The final 10 minutes was spent scribbling in a couple of thoughts,doodling in arrows and dividing lines between days and the heading, which actually took much less than 10 minutes – go figure! So now you are all pretty much up to date with this work. Let me know what you think. 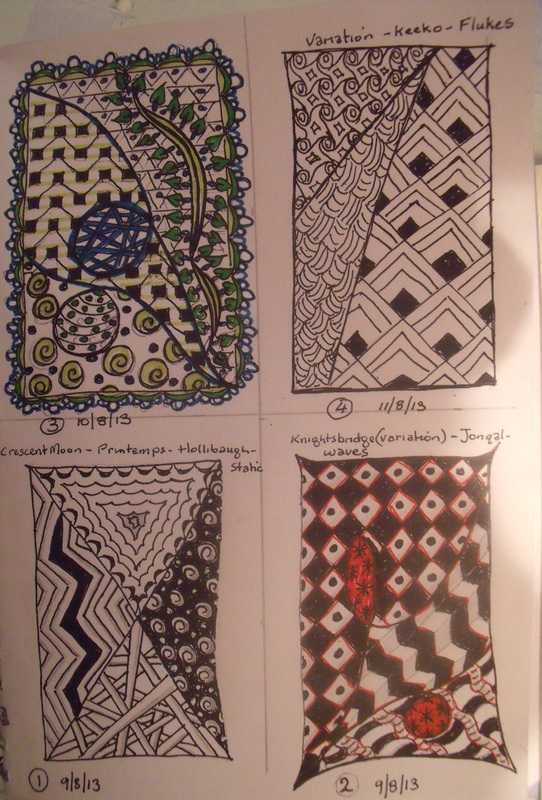 The last few nights have slipped by in a haze of happy doodling ……. and it has slowly led me back to remembering how it feels to draw ………. It’s ever so slightly painstaking. This cat started off twice the size you see here. 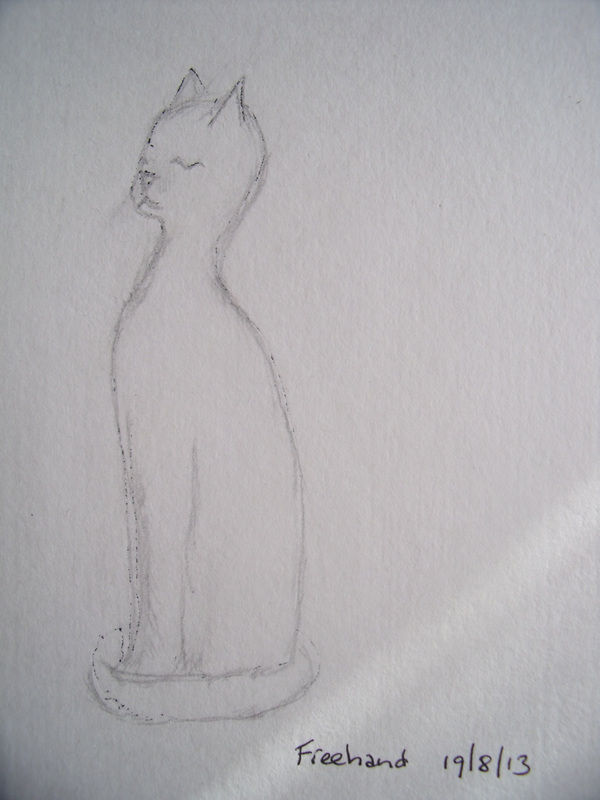 The eraser was utilised every bit as much as the pencil and it grew slowly but steadily smaller as it began to resemble this snooty looking feline. 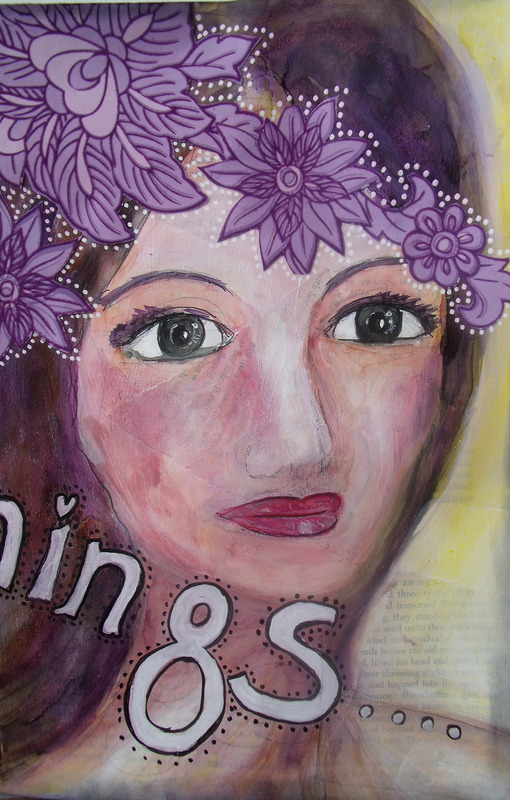 This is such fun – I feel like my creativity is beginning to move again! Thanks for dropping by today, I do hope you are enjoying these doodling posts! 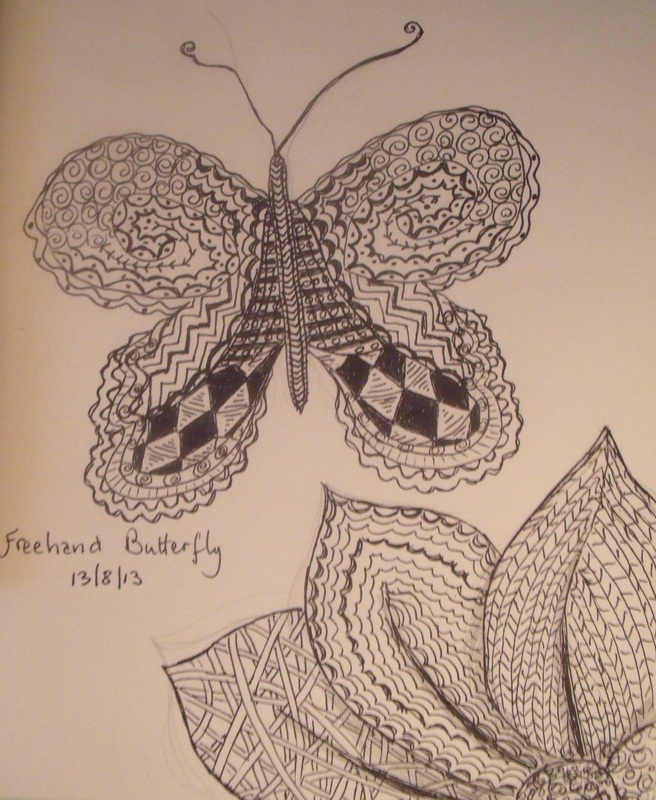 I’ve been teaching myself the art of zentangling – which, if you don’t know, is the practise of making little drawings or letters and filling them in with an assortment of patterns to produce something quite eye-catching. Typically the work is done with pencil and pen, and therefore black and white. I know some people work with exacting measurements but not I…. 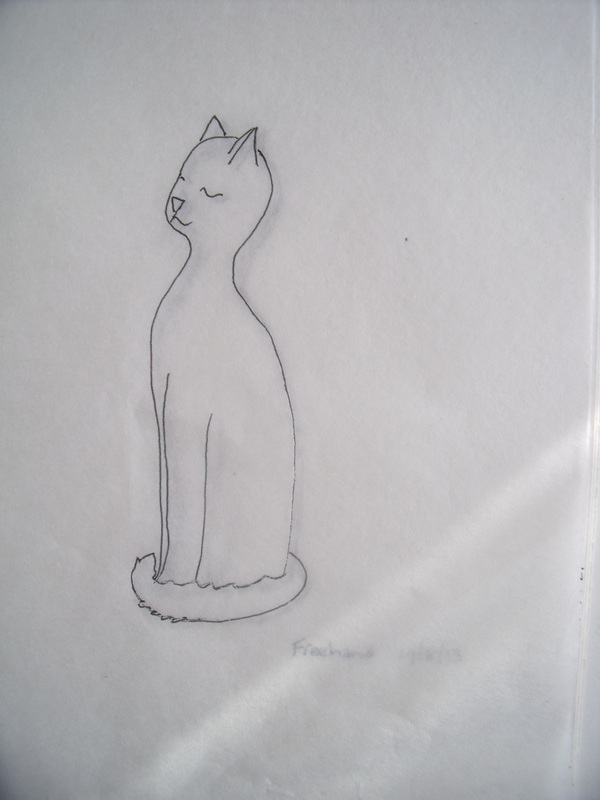 Oh no, I must do freehand – and I must introduce some colour also – just to see what it looks like you understand. Far from perfect – very far! – but quite absorbing to do and almost meditative. 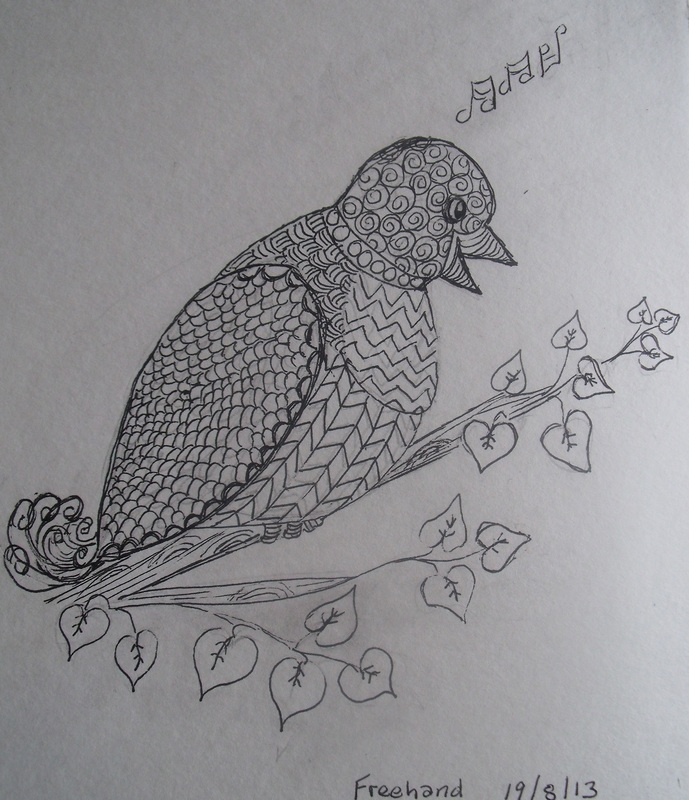 Again, as you can see, very far from perfect – but not too bad for just the fifth try – do you agree? Now while I was playing around with all that, I also took a short [and totally affordable!] 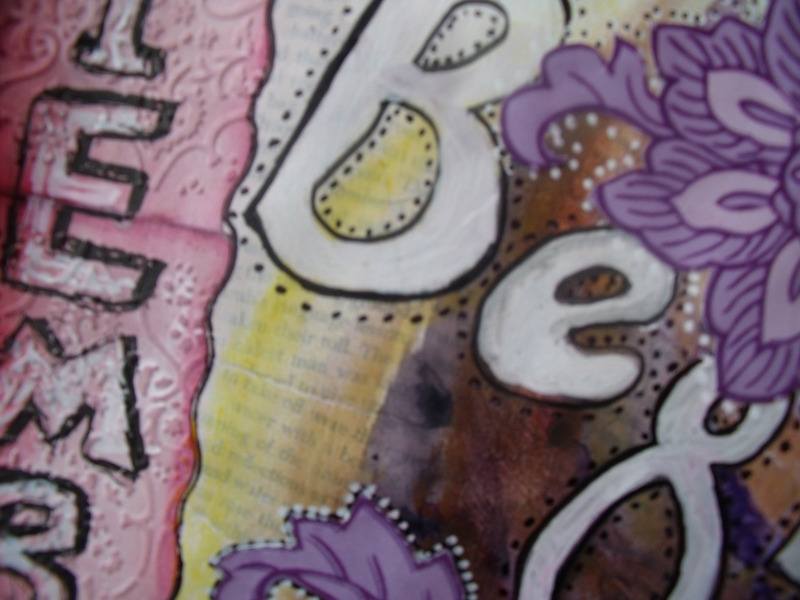 on-line introductory course with the one and only Julie Fei-Fan Balzer on lettering. I’ve always thought what she does is quite eye catching but never quite knew where to start to give it a go myself. It is remarkably easy and very fun. She is a great tutor – no airs and graces and makes it up as she goes along, which is just like in real life and completely disarming…. 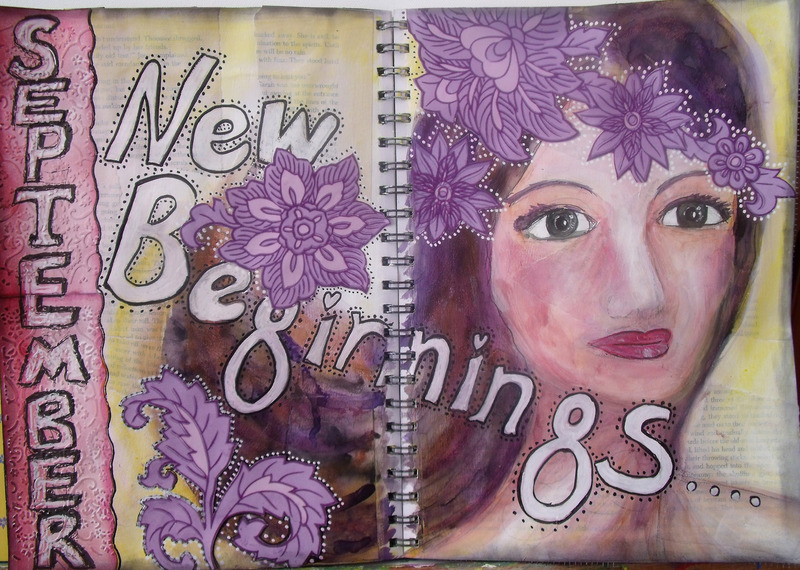 I’m really pleased, happy and excited to see where else I can go with this new style of writing, especially in my art journal. So that’s what I’ve been doing for the past five days or so – all-in-all a most satisfying week!